Nik of Thyme, right? I’ve been struggling to keep up with things the past couple of weeks and Thanksgiving isn’t really celebrated in Mexico so I’ve gotten a bit behind. I didn’t want to miss the occasion completely though, so here I am at the last minute just as my name sake suggests. A chef of true inspiration Sean Sherman is a voice I have followed for the last couple of years. Today he wrote a piece for Time that should be read and considered. When we get to know and understand more stories, we are stronger. Ignoring what we haven’t lived doesn’t make it go away. NPR has been with me since high school and they never cease to inspire me. Today they also posted about multicultural Thanksgiving and they give a far better voice to my idea than I could have. I was so happy to read this today while I struggled to finish off the edges of my own essay. I hope you read it and enjoy the beautiful tables that will be surrounding you and your neighbors this holiday season. Seriously. STOP. Go back and read the above two articles, don’t even read mine if you don’t have time. The voices above are way more important than my own. We are one nation, and no matter how different our stories the story of how we started is always the same. The required reading above is meant to show you how similar we are despite all of our differences. Thanksgiving is a shady holiday, brought about after the civil war to rekindle broken relationships. It was never a perfect holiday, it was never a perfect story. We shouldn’t be ashamed of that, only aware and empathetic of the roots and pain this holiday has caused. We can continue to celebrate and enjoy Thanksgiving as long as we do it consciously and with respect. The first step is to stop lying to yourself. The United States was colonized and stolen, no that isn’t your fault but your story is built upon that. Understand your place in the history and understand how you can actively work against oppression and persecution. The very first step is understanding Thanksgiving is a lie and we (our ancestors weather we like them or not) killed many many Native Americans in our pursuit to build a new nation. We have to stop teaching our children about the Pilgrims and the Indians, especially in that terminology. We have to be honest with them, even from a young age that it was a rough and turbulent world that we chiseled for ourselves out of other people’s existence. They need to know it wasn’t peaceful, dual existence. Children can understand and accept a lot more than we give them credit for. Of course your Kindergartener can’t understand the whole story, but you can start with the basics and add more information each year. It’s much easier to start with the truth slow and at their level than to start with a lie and reteach the truth later. The next step is to stop persecuting others. It’s as easy as not judging anyone, it’s something even the bible strives to teach you over and over again to not judge the sick, the weak or the different. The same morality should be used to not judge religions or practices that are different than your own. We can make a huge difference in the world if we just learn how to fully respect others and drop our judgement. Article after article is written each year about how to survive the holidays with your overly politically aligned family members. Use all that advice you have amassed from year after year of family dinners to interact with strangers too. Lastly give back, stand up for what you believe in. The beauty of the United States is in the diversity and giving spirit we have. Thanksgiving isn’t only about saying thank you its about giving too. Volunteer with sick children, or in a food shelter, or with the homeless. Drive retired veterans to and from their hospital visits and take them out to lunch. Clean up the litter on your street, your park, your nearest country road. Shovel snow for your neighbors. Donate to charities you believe in. No matter who you are or where you are there are ways to get involved and get things changing in your own community. Global and National news may seem grim, but look to your own backyard first and give all of yourself and you will find a better more tolerant world, without judgement is only a few steps away. Idealism aside, let’s talk. I’m always open in DM, e-mail and even in the comments section. I know it’s a hard part to navigate our past, present and future as a nation but I know it start with respecting others and eating. Food: Is what makes every holiday a holiday. You can’t change my mind, celebrations aren’t the same without the cookies, cakes, soups and salads that accompany them. 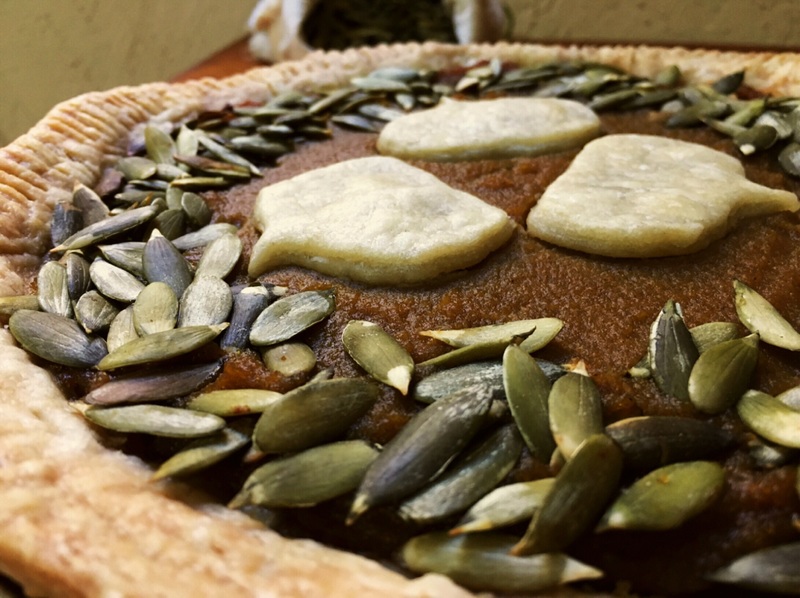 Thanksgiving has some traditional dishes, but those are all made up anyway. You should feel free to make your own special day with the dishes you love the most. I’ve included a list of my favorite traditional dishes, but I encourage you to start a new tradition and celebrate with your favorite food this year. Im celebrating the blogs I love the most in this list, I hope you enjoy them. I always make my mashed potatoes with olive oil and here’s a blog that gets it. In my house, you can’t skip the spuds no matter what else is on the table. We always joked that mom planned the type of potato we were eating first. If you follow along closely enough you know I make this recipe every 15 days or so. I suggest only the same for you. My first great blogger love can’t be far from my perfect Thanksgiving menu. 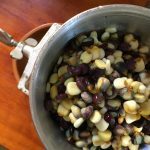 This twist on green beans is my favorite way to eat them, I promise they are better than the soft mushy things that come out of casserole dishes. It’s obvious why I like this blog right? She also mixes spices like I’v enever seen and that is a constant source of inspiration for me in my own pursuit of the next recipe. You can make anything for dessert, and I encourage you to soar to the expanses of your heart for the perfect dessert. But if you want and easy pie this one is it. I love my family because we are the picture of American diversity. My Irish descendant great grandmother gave birth to her children in the mountains of Idaho where present day Nez Perce still entangle themselves in the past and present culture. This has created a web of great aunts and uncles, their children and grandchildren each more open and diverse. Don’t get me wrong we are still among conservatives and liberals and everyone in between. Family always includes all kinds after all, we have invited Japan, Hawaii, and Cambodia among other immigrant muts from German and Italian heritages to fall into the folds. Even I bring my own Yucatecan addition to the family. Growing up I wasn’t really aware of all that though and the only Aunt from the extended family I remember starkly was my Japanese born Great-Aunt who married my grandma’s brother. I recently visited their daughter, my cousin, and we ate our way through the visit. 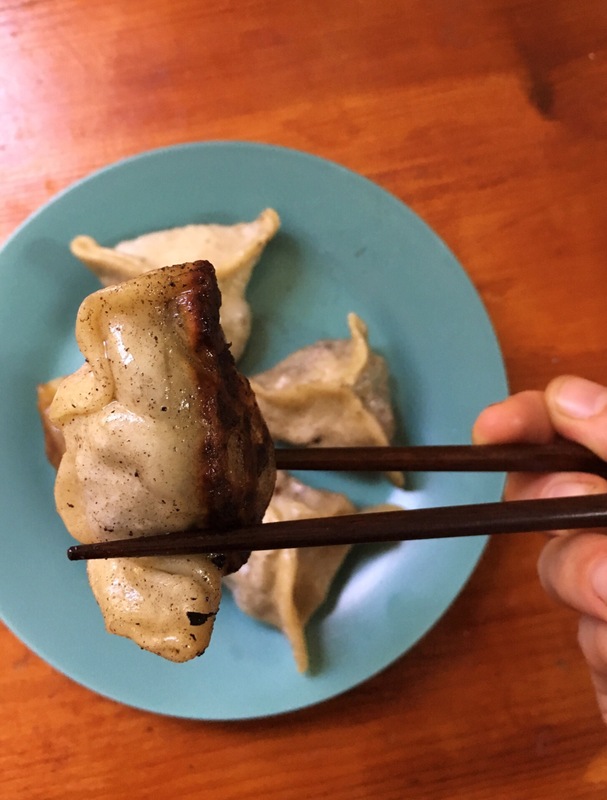 One day we ate all Japanese from soup to seaweed and the pan-fried pot stickers couldn’t be passed up. This is one of my favorite dishes, but in Mexico it’s impossible to find the wrappers to make them. I put my head down and my hands into the bowl to learn this dough and bring you my version of this dish. 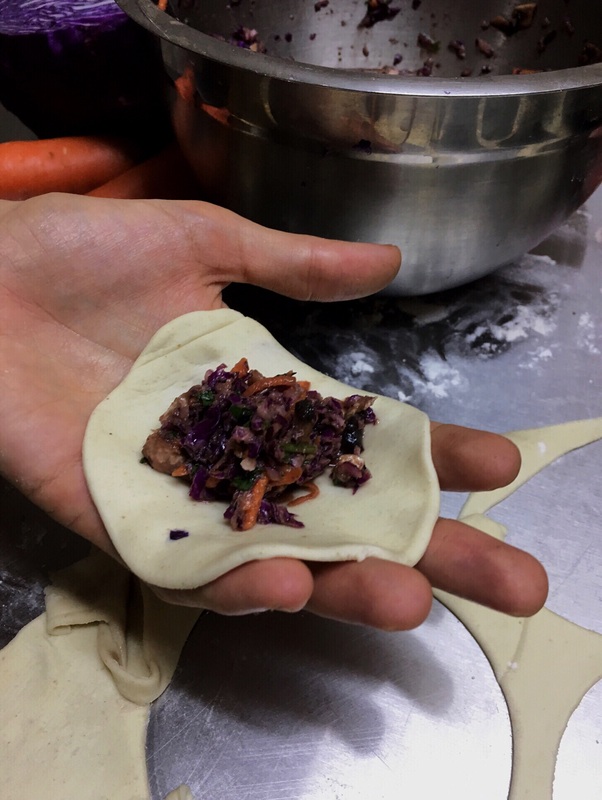 Food like gyoza from scratch is slow food and meditation, it takes a lot of time to make, roll, cut and fill these but each action is a moment to breath and be thankful. I personally couldn’t think of a better Thanksgiving food to celebrate with this year. 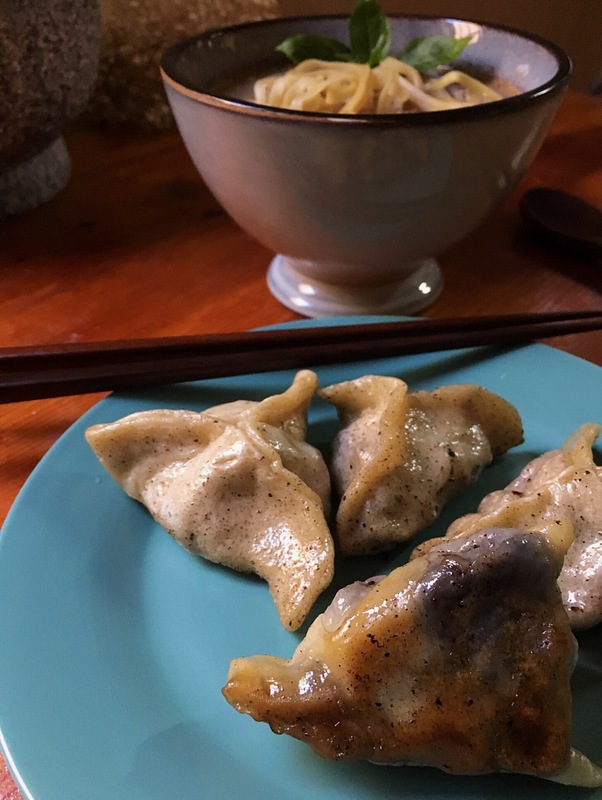 To make the gyoza wrappers add the flour to a large bowl with a generous pinch of sea salt. Make a well in the center and add the water. 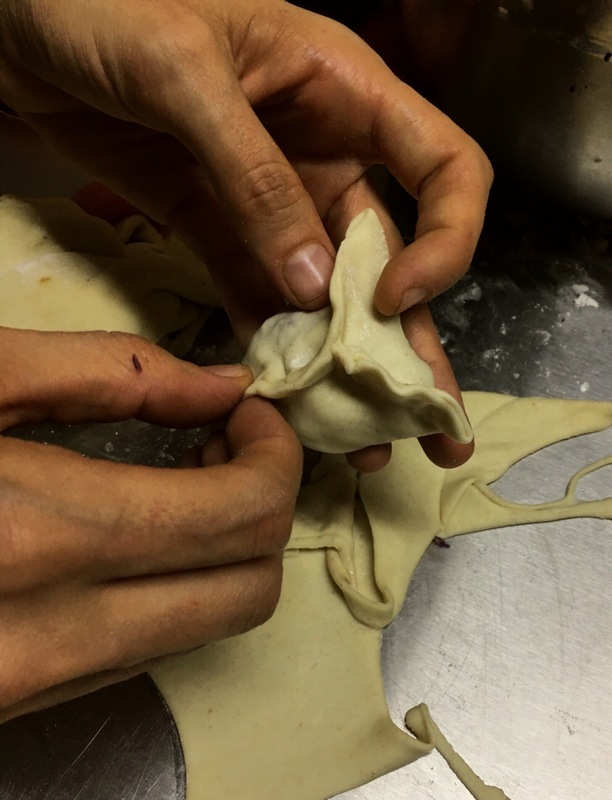 Combine to form a soft dough, a small splash more of water may be necessary. Turn the dough out onto a lightly floured surface and knead 10 minutes until very smooth and elastic. 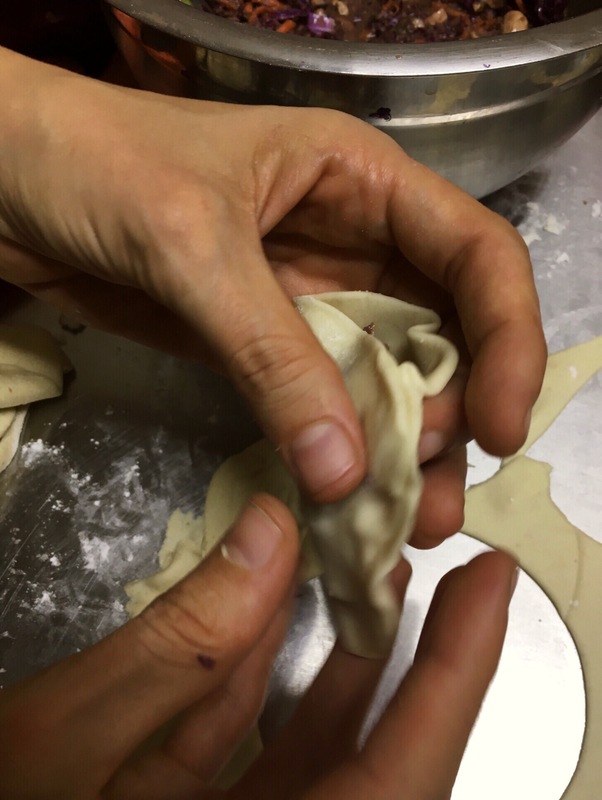 Shape the dough into a ball and transfer to a lightly oiled bowl. Allow to rest at room temperature for at least 1 hour. Shred the cabbage and carrots together. Mince the mushrooms and stir all three together in a big bowl. The rest of the ingredients and mix well. Start to fill your wrappers. I find that as the salt works into the cabbage and mushrooms they let off a lot of juice. In the beginning I stir the vegetables frequently to incorporate well After about 10-15 minutes it gets very juicy and I usually drain off the water by putting the filling into a fine mesh strainer. Turn out the dough onto a lightly floured surface and divide into 4 even parts. Roll out one of the parts into a flat round until is it 1mm thick. It in dough they should be very very thin, but not breaking. If your dough is too tough or not being forgiving let it rest 5-10 minute more. 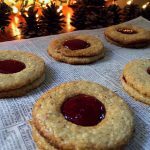 Cut neat circles with a 3 ½ inch (9.5cm) cookie cutter. Continue cutting and filling wrappers as needed or until you have no more dough. If the dough becomes too stiff towards the end add a bit of oil to soften it again. I almost always fill as I cut to not worry about flouring and stacking wrappers. I found this video very helpful when learning how to fold. I am far from perfect, but it’s taste not looks that count anyway. 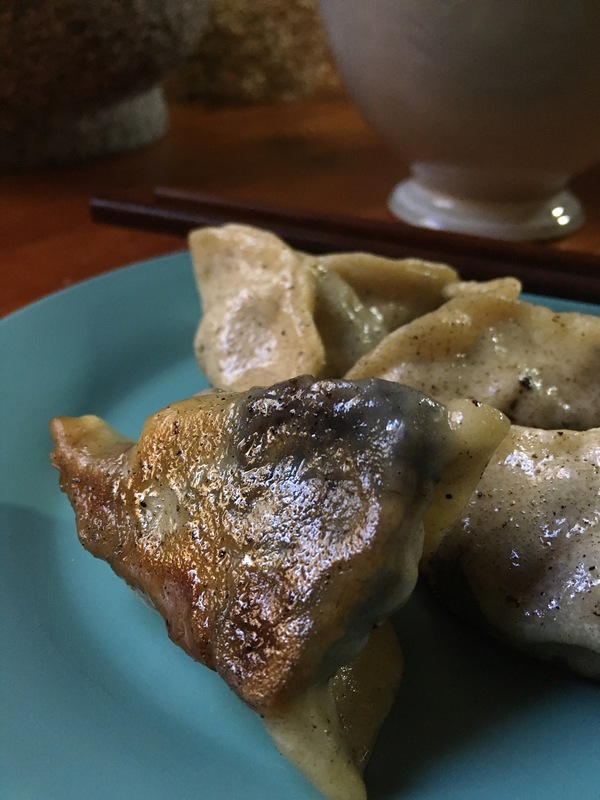 After filled the gyoza can be cooked right away or frozen on cookie sheets for storage. Heat a cast iron or heavy bottom pot well and add a very small amount of oil to the bottom of the pan. Once the pan is well heated add the fresh or frozen gyoza. You may put them close together but do not move them once you have place them. They will break if moved too soon. 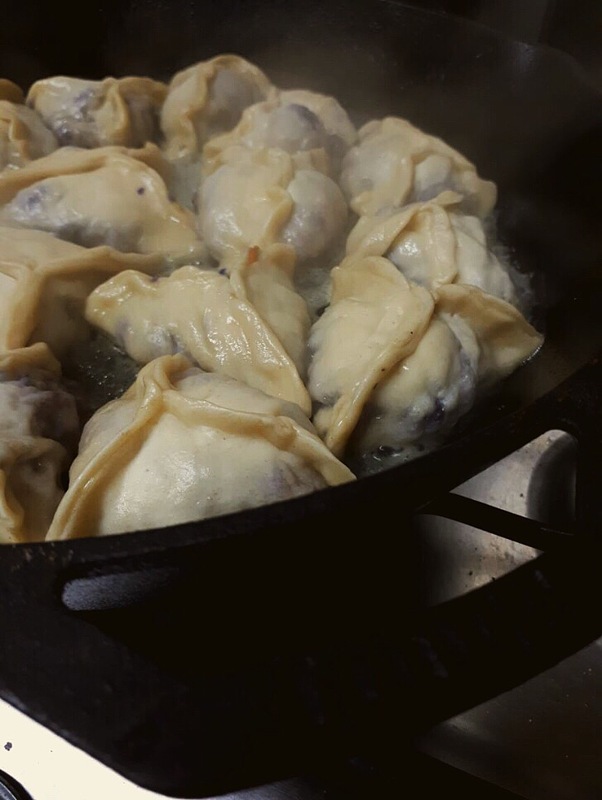 Cook on medium heat, allowing the bottoms of the gyoza to brown completely. You should see them browning without having to move them but be careful not to burn them. Once brown immediately add 1 cm of water to your pan and cover with a lid. Allow the gyoza to steam for 2-3 minutes until all the water has evaporated and the bottoms have began to crisp again. You will know when because they will release from the bottom of your pan with no effort. If they are not ready they will start to break.